WHY WEAR A T-SHIRT UNDER YOUR SHIRT? Men often wear a T-shirt underneath a shirt, hoodie or sweater. They do this to keep their clothes fresh for longer and to look neat and professional. Another reason to wear a T-shirt under a shirt can be the extra warmth it provides, or the fact that a T-shirt fits comfortably underneath a shirt and can still be invisible. By wearing a T-shirt under your shirt, perspiration is caught. This keeps your outer clothes fresh for longer throughout the day. An even better option is a bamboo T-shirt. A bamboo T-shirt is more comfortable and breathable than a cotton T-shirt. With a bamboo undershirt you stay fresh even longer. A T-shirt under your shirt does not only ensure that your outer clothes stay fresh longer. 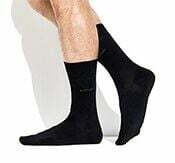 It also gives your outfit a neater look. 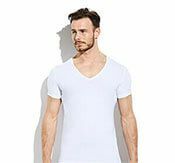 The undershirts by Bamigo are invisible under your shirt, unlike a casual shirt, which is often visible under your shirt. In addition, you get cold much less quickly when you wear a T-shirt under your shirt. A T-shirt under your shirt provides an extra layer of clothing, which means that more heat is retained. A long undershirt stays tucked into your trousers, and that also ensures that you stay warmer. Wearing a jacket is no longer necessary to stay warm, but can of course serve as a stylish item of clothing. A T-SHIRT UNDER YOUR SHIRT; WHAT SHOULD YOU PAY ATTENTION TO? Which specific T-shirt you choose to wear under your shirt depends on your style. Make sure that the T-shirt has a comfortable fit and presents well. Match the neckline to your clothes, and don't forget to pay attention to the colour of the T-shirt. In addition, it is important to look at the length of the T-shirt. If a T-shirt does not fit well, you will often see it through the shirt. That is why it is not a bad idea to opt for a slim-fit T-shirt. But there are men who don't like the feel of a slim-fit T-shirt. In that case you can opt for a T-shirt with a slightly looser fit, like our loose fit T-shirts. Both fits have the advantage that they stay tucked into trousers because of the extra long fit. An untucked undershirt is often visible. This makes that little bit of extra length even more important! Match the neckline of your undershirt with the neckline of the clothes you wear over it. For example, a black T-shirt with a V-neck fits perfectly with a black shirt with the top button undone. If you want to be sure that your T-shirt is invisible, choose an invisible khaki T-shirt. Because the difference between the colour of the T-shirt and your skin colour is small, the chance that you see the edges of the T-shirt is much smaller. Which T-shirt best fits under your clothes depends on your style and taste. 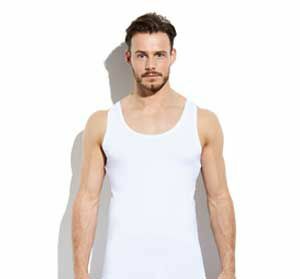 The Bamigo range varies in fit, neckline and colour. Which T-shirt will you choose?